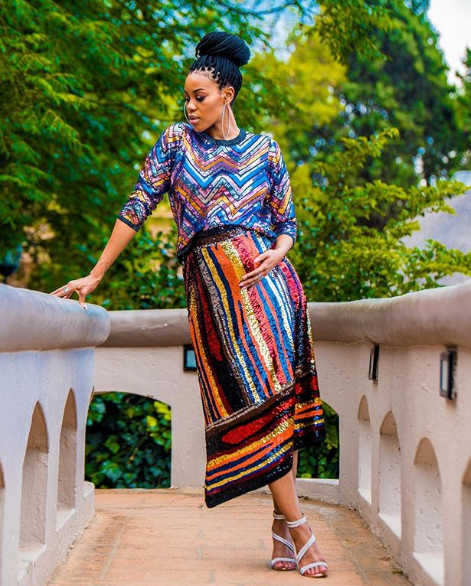 TV and radio personality, Luthando ‘LootLove’ Shosha has described her baby shower as “one of the best days” of her life. The MetroFM host’s loved ones gathered around her to celebrate her motherhood and shower her with gifts. LootLove is carrying her first two children whose father is rapper, Sizwe ‘Reason’ Moeketsi who was by her side during the shower. Also in attendance were Loot’s close friends including friend and MetroFM co-host, DJ Speedsta, celebrity stylist, Dumi Gwebu, Luxury Specialist, Masi Tontsi, fashion and lifestyle blogger, Siyanda Bani and popular television producer, Wenzile Dlamini. Some of her family members, including her younger brother, were also present for the festivities. Loot and Reason kept the shower’s theme neutral with white, gold and yellow decorations to celebrate the fact that the couple will have a boy and a girl. LOOTLOVE RELIEVED TO NOT BE HIDING ANYMORE! Loot wore a stripped, multi-coloured sequenced two-piece, while her baby daddy kept it classic in a black and white suit. PICS: LOOTLOVE IS HAVING TWINS!